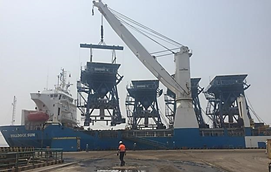 Kenya Port Authority celebrates reception of 4 cutting-edge ecological hoppers to improve their dry bulk import process and also mitigate environmental damage from fugitive dust. These are the first dust filtration import hoppers to be provided with ATEX certification. This equipment was sourced to fulfil the aims of TradeMark East Africa/Kenya Port Authority Port Resilient Infrastructure Programme to improve port facilities whilst minimising the environmental impact of port operations. There has been considerable investment in the future capabilities of the Port of Mombasa with the aim of creating a regional hub to support trade in the area over the coming years. Implementation of the Mombasa Resilient Infrastructure Programme encourages the development of port efficiency measures whilst minimising energy consumption and protecting the important natural resources. Following a lengthy tender process SAMSON Materials Handling Ely/UK was successful in winning the contract to provide TMEA/KPA with 4 Eco Hoppers to import clinker, coal and gypsum. To adhere to strict performance and environmental requirements these Eco Hoppers are decked with inlet grills with suction capacity, a reverse-jet cleaning system, air compressors, a flex-flap filtration system creating a pressure differential between the inner and outer hopper areas and dust filters on three sides of the hopper. The SAMSON Eco Hoppers are fully mobile with powered travel and crabbing functionality which lets them be positioned alongside the vessel for unloading and which will allow them to be manoeuvred off the quay and freeing up important space when not required. These are the first ever ecological hoppers to be provided with ATEX certification which emphasises the increased awareness of safety and environmental issues in conjunction with high performance. Peak rates of 700 tph per hopper are expected to considerably improve the import capabilities of the port. Multiple arms of the AUMUND Group of companies were coordinated to execute this important project and AUMUND Logistic was responsible for the shipping to Mombasa. Following partial assembly offsite to minimise disruption to the port, the semi assembled Eco Hoppers were transported by sea and arrived ready for final assembly at the Port of Mombasa in June 2018. Comprehensive training has been provided for Kenya Port Authority at SAMSON Materials Handling and a team of engineers is now working on commissioning the Eco Hoppers ready for use on import shipments.